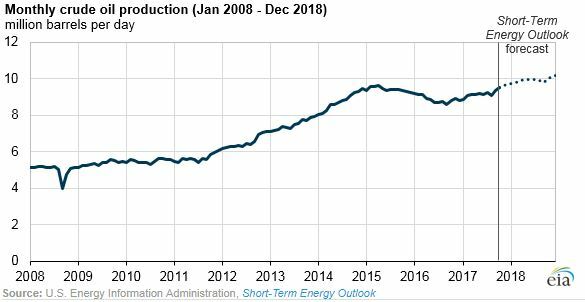 The U.S. Energy Information Administration (EIA) released its latest drilling productivity data this week, reporting that shale oil production is set to increase in November for the 11th straight month. In total, crude oil production from shale development is estimated to reach a record 6.12 million barrels per day (b/d), while shale natural gas production is expected to increase for the eighth consecutive month to 60.9 billion cubic feet per day (Bcf/d). Thanks to incredible growth in shale development through technologies such as hydraulic fracturing (fracking) and horizontal drilling, the United States is now firmly positioned to not only meet domestic energy demands, but also provide vital energy resources to trading partners around the world via record oil and natural gas exports. Here’s a closer look at these remarkable trends. According to EIA, U.S shale oil output is projected to increase by 81,000 b/d from October to November, with the majority of this growth – about 50,000 b/d – coming from the Permian Basin of West Texas and southeastern New Mexico. Oil production in Oklahoma’s Anadarko region and North Dakota’s Bakken is expected to grow by 9,000 bpd and 8,000 b/d, respectively, while the Niobrara Shale in Colorado and Wyoming is estimated to increase by 9,000 b/d. Overall, crude oil production from U.S. shale regions is expected to reach 6.12 million b/d, almost two-thirds of which stems from production in Texas’ Eagle Ford and Permian shales. Together, these two Texas shale plays will account for nearly 3.9 million b/d in November, with Permian production alone estimated to top 2.66 million b/d next month. As oil production from shale development continues to grow, EIA is forecasting that overall U.S. oil production will reach an average of 9.9 million b/d in 2018, exceeding the record high of 9.6 million b/d set in 1970 – a feat made all the more impressive by the two years of low oil prices relative to the highs of the early 2010s. 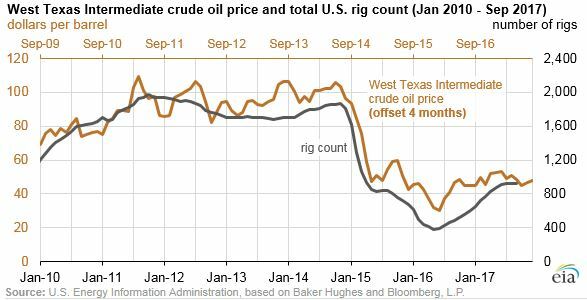 The West Texas Intermediate (WTI) oil price, the U.S. crude oil benchmark, has dropped by over 50 percent from its high of over $100 at the end of 2014. Yet, despite a difficult market, production is thriving as companies are investing in efforts to streamline production, as well as technologies that help produce more oil at lower cost. Moreover, EIA’s prediction of record production comes even as U.S. rig counts are half of what they were just two years ago. In 2014, American oil production increased by 1.2 million b/d – the largest annual growth at the time – hitting an average of 8.7 million b/d. According to Baker Hughes, 2014 production was achieved with an annual average of 1,862 active rigs, yet currently there are 932 active rigs producing an average of 9.4 million b/d. This means that more than 700,000 b/d is being produced with half as many rigs, a testament to the advancement in shale development over just the past few years, as well as the rich natural resources in the United States. As with oil production, natural gas production is also soaring. According to EIA’s latest data, U.S. shale gas production is expected to increase by 827 million cubic feet (Mcf/d) next month, with majority of this production coming from the Appalachian Basin (Marcellus and Utica shales) in the Northeast United States. Stretching across the Pennsylvania, New York, West Virginia and Ohio, the Appalachian Basin alone is expected to grow by nearly 400 Mcf/d in November, with significant production growth also coming from the Permian. Surprisingly, natural gas production from the Haynesville Shale in Louisiana is projected to increase by 146 Mcf/d next month, as this once dormant play is seeing new life thanks to lower cost production and higher demand from Gulf Coast petrochemical and LNG infrastructure. In total, natural gas production from shale development is expected to top 60.9 Bcf/d. But while the Appalachian Basin, Permian and Haynesville are leading the expected production increase, EIA data shows that all seven of the major U.S. shale regions are forecast to increase in natural gas production. Like oil production, advances in shale development have led to unprecedented growth in domestic natural gas levels, helping U.S. production grow roughly 39 percent in just the past 10 years. As production levels reach record highs, the U.S. now has the unique opportunity to become a key player in the global energy market just a decade after being one of the world’s largest importers. As the world’s largest producer of oil and natural gas, the development of liquefied natural gas (LNG) export projects across the Gulf Coast and the lifting of the oil export ban in 2015 has boosted U.S. exports of both oil and natural gas, bringing with it billions of dollars in economic impact. In fact, over just the last year, LNG pipeline receipts (natural gas going to LNG facilities) have increased from an average of 0.0 Bcf/d in October 2016 to 2.8 Bcf/d this past week. 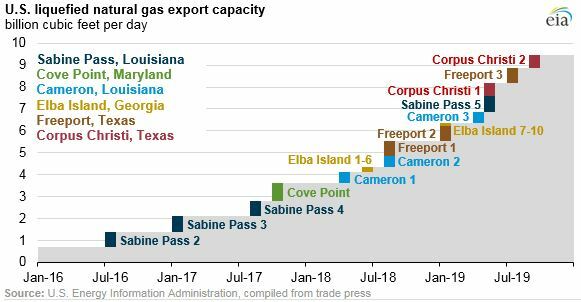 Moreover, the United States is expected to become a net exporter of natural gas by the end of 2017, as U.S. liquefaction capacity is expected to grow from 1.4 Bcf/d at the end of 2016 to 9.5 Bcf/d by the end of 2019. This development will infuse billions of dollars into the American economy – as much as $73 billion by 2040 – and provide hundreds of thousands of jobs to hard working Americans. Already, the influx of oil and natural gas production is driving substantial investment across the United States. A report from the Texas Oil and Natural Gas Association (TXOGA) found that as of June 2017, companies have announced $71 billion of potential investment to build new chemical manufacturing facilities or expand capacity along the Texas Gulf Coast. Additionally, nearly $50 billion in infrastructure development is planned for the Port of Corpus Christi alone, thanks to oil production from the Eagle Ford shale in South Texas, as the Port of Corpus Christi now exports more crude than other U.S. port at 316,000 barrels per day. To put that in perspective, that’s double what the Port was exporting just a year ago and, at $50 a barrel, would still equate to almost $5.8 billion in oil exports per year. As this latest EIA data show, advancements in shale development continue to improve American oil and natural gas production while also lowering costs. By keeping the U.S. industry competitive in the face of low commodity prices, shale development has helped position America as a global leader in oil and natural gas production, and is driving our ability to become a top exporter as well.